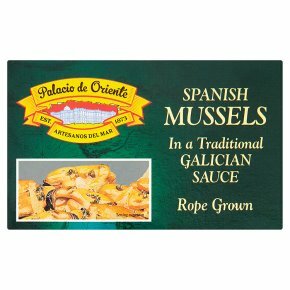 Rope grown.These delicious mussels have been sustainably rope grown in the Galician Rias. They have been cooked in a wonderful sauce containing tomatoes and fresh onions and are ready to enjoy as an authentic Spanish Tapas dish, either cold or gently heated. The unique conditions of "Las Rias Baixas" gives them their very special flavour and texture. Serve with a crusty bread, salad, rice or pasta. Warning: This is a natural product and although every care is taken to remove shell, some small pieces may remain.